Well this fits the current weather perfectly Caz. A lovely winter scene and a great stag. Fabulous Caz! 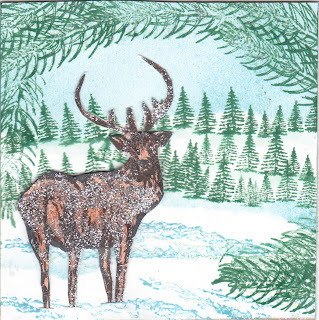 A beautiful winter scene.. love how you did your snow, greenery and that stag is awesome! You captured the winter scene beautifully. I love your winter themed scene! Your winter scene is so lovely. I really love your tree lines in the background and the larger sprigs of evergreen framing the stag image and scene. Thanks so much for playing in our the Craft a Scene challenge.